An individual detached family home originally constructed by Berkeley Homes. Internally the property offers SPACIOUS accommodation comprising open plan sitting room and dining area, uPVC conservatory, study, kitchen and utility room. 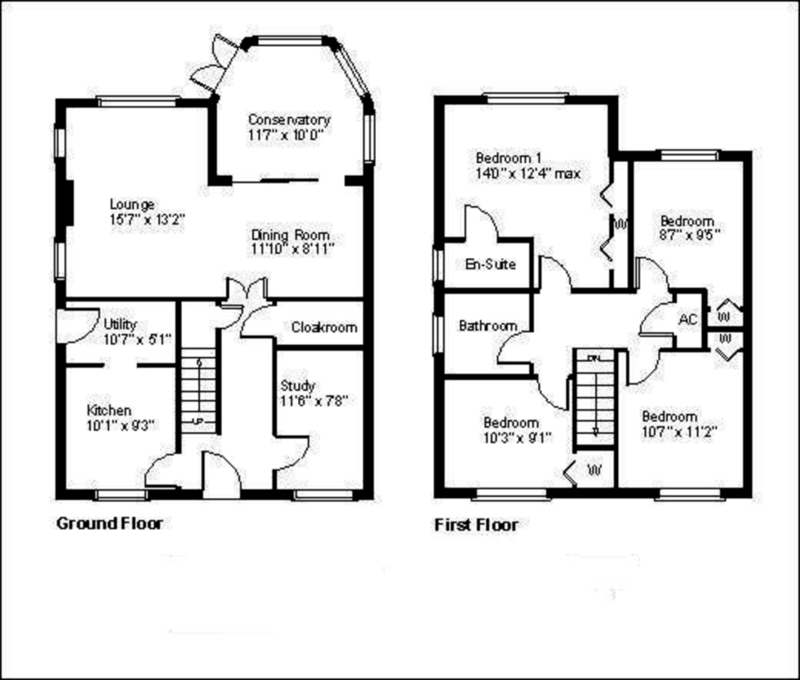 Upstairs there are four good sized double bedrooms with master bedroom having en-suite. Outside the front garden is enclosed by dwarf walling with wrought iron railings, with side driveway leading to electric wrought iron security gates and DOUBLE GARAGE. The rear garden is mainly laid to lawn with a large raised decked area. The property is offered for sale with NO ONWARD CHAIN. ENTRANCE HALL Radiator, understairs storage cupboard, wall-mounted thermostat control for hot water and central heating, telephone point. GROUND FLOOR CLOAKROOM Low level flush w.c., wall-mounted wash hand basin, radiator. CONSERVATORY 11' 7" x 10' 0" (3.53m x 3.05m) Brick and uPVC construction with tiled flooring, radiator, double doors leading to rear garden. UTILITY ROOM 10' 7" x 5' 1" (3.23m x 1.55m) Wall-mounted 'Worcester' combination boiler, radiator, double glazed doors leading to rear garden. STUDY 11' 8" x 7' 8" (3.56m x 2.34m) Radiator, double glazed windows, TV point, telephone point. FIRST FLOOR LANDING Radiator, access to loft space, shelved linen cupboard. EN-SUITE SHOWER ROOM Fully enclosed double shower with folding screen and fitted independent shower, low level flush w.c., pedestal wash hand basin, radiator, extractor. BEDROOM TWO 11' 2" x 10' 7" (3.4m x 3.23m) Radiator, double glazed windows, built-in wardrobe cupboard, TV point. BEDROOM THREE 10' 3" x 9' 1" (3.12m x 2.77m) Radiator, built-in wardrobe cupboard, double glazed window. BEDROOM FOUR 9' 5" x 8' 7" (2.87m x 2.62m) Radiator, double glazed windows, built-in wardrobe cupboard. FAMILY BATHROOM Panelled bath with fitted shower attachment with folding screen, pedestal wash hand basin, low level flush w.c., radiator, part tiled walls, extractor fan, double glazed window. FRONT GARDEN Mainly laid to lawn with flower and shrub borders, enclosed by brick walling and wrought iron railings. DETACHED DOUBLE GARAGE 19' 2" x 18' 4" (5.84m x 5.59m) Automatic up and over roller door, power and light.